22 Days Nutrition had a unique opportunity when the star musicians announced last December that they were going vegan with the help of the company. Thousands of visitors descended simultaneously on the website. And the site didn’t crash. Instead, it maintained normal function and could then maximize the positive benefits of the tremendous publicity. Such moments are precious for any business, but they tend to stay rare for those unready and become commonplace for those with greater foresight. 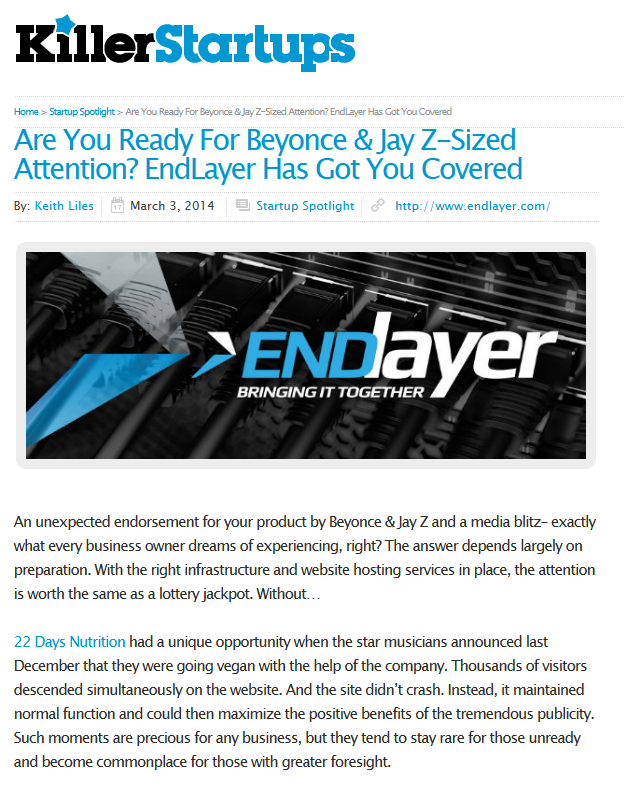 Behind the successful handling of the massive traffic overload at 22DaysNutrition.com was EndLayer, a high-performance website hosting and IT solutions provider. Founded in April of 2013, EndLayer provides fully-managed cloud hosting services and custom solutions. The company is dedicated to offering a premium network with secure data centers and constant, expert support.